Dogs in Parks Cover Contest! Home / 2018 / November / 13 / Dogs in Parks Cover Contest! Votes were counted on November 12 at 4:30 p.m. Congratulations to our winner, Oakley! You will see Oakley on the cover of the March – May issue of Centerville-Washington Park District’s News & Events. Though the contest is over, you can still visit Facebook to view all of the entries! Let’s make your dog Centerville famous! 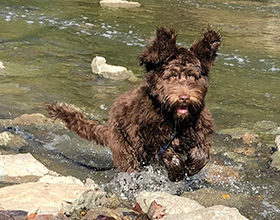 Submit a photo of your dog in a Centerville-Washington Park District park for a chance to appear on the spring 2019 cover of the park newsletter. 27,000 copies will be printed and mailed out to the community in late January! Dog must be pictured on a leash in a CWPD park or inside the fences of the Dog Park at Oak Grove Park. Submit photos to mail@cwpd.org by November 5, 2018. Include both your dog’s name and the park’s name to be considered for the contest. Photos of the appropriate size and orientation to fit on the cover will be posted on the CWPD Facebook page. There will be a one week voting period to select the winner! By submitting your entry, you agree to allow CWPD to use your photo at any time in the future. Contact us at mail@cwpd.org or 937-433-5155 if you have any questions about the Dogs in Parks Cover Contest!